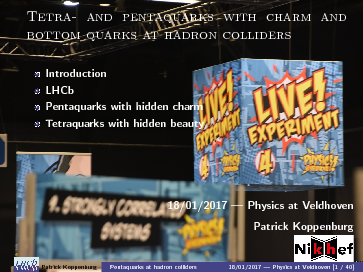 Physics@Veldhoven, Veldhoven, 17-18 January 2017. 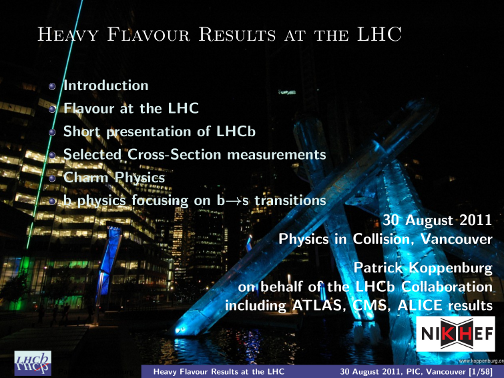 QCD@LHC, Zürich, 22-26 August 2016. 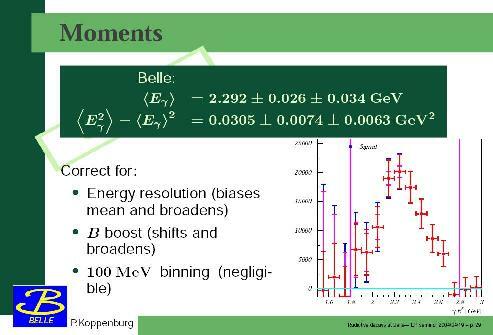 SWHEPPS 2016: Strategy Workshop on High-Energy Particle Physics in Switzerland, Unterägeri, 08/06/2016. 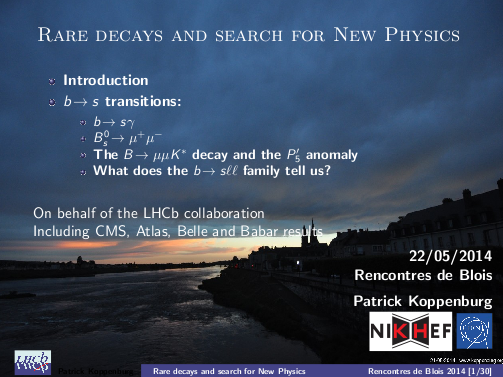 Paul Scherrer Institute Thursday Colloquium, Paul Scherrer Institut, 03/12/2015. 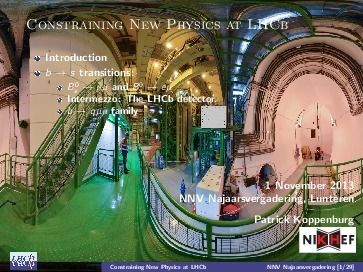 Nederlandse Natuurkundige Vereniging (section subatomic physics) Najaarsvergadering, Lunteren, 01/11/2013. Physics in Collision, Vancouver, 28 August-1 September 2011. Nikhef Colloquium, Amsterdam, 9 July 2010. 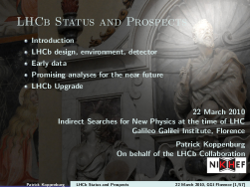 Invited talk at Indirect Searches for New Physics at the time of LHC Conference, Galileo Galilei Institute, Firenze, 22-24 March 2010. PPAP community review of particle physics science programme, Birmingham, July 13,14,15 2009. Nikhef, Amsterdam, 10 June 2009. 5th Workshop on the CKM Matrix, Roma, 9 September 2008. 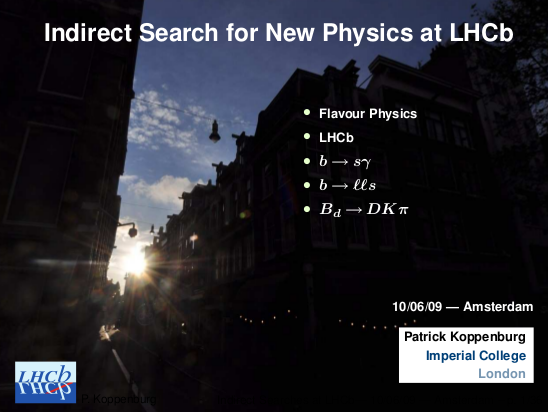 Flavor Physics in the Quark Sector, report of the workshop. 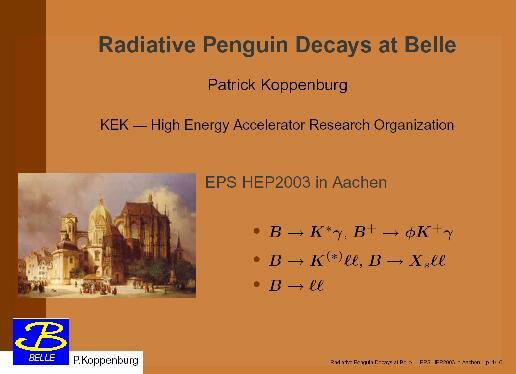 arXiv:0907.5386 (hep-ph). SHEP Seminar, Southampton, 16 May 2008. 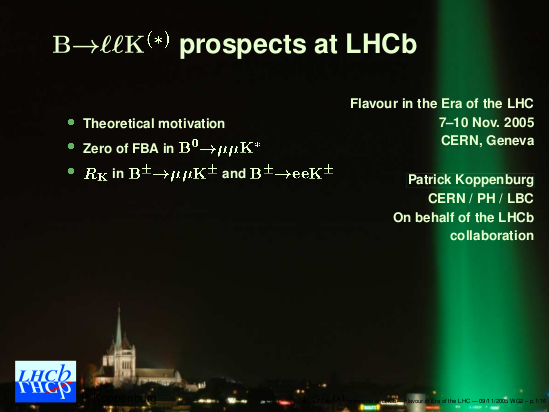 LHCb & Theory meeting, CERN, 16 March 2007. Beach 2006 - The 7th International Conference on Hyperons, Charm And Beauty Hadrons, University of Lancaster, July 2-8, 2006. Imperial College, 17 November 2005. 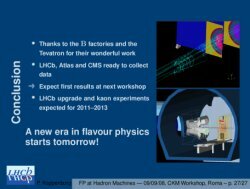 First Flavour in the era of the LHC workshop, CERN, November 9 2005. Beauty 2005 Conference, Assisi, June 23. CERN EP seminar, April 19, 2004. 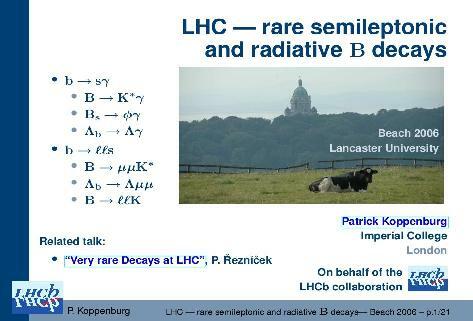 Second Workshop on the Discovery Potential of an Asymmetric B Factory at 1036 Luminosity, SLAC, October 22-24, 2003. HEP2003 Europhysics Conference, Aachen, July 17-23 2003. CERN Workshop on Monte Carlo tools for the LHC, Geneva, July 7 - August 2 2003. Journées pour la science et la technologie, Tōkyō, November 17-19 2002. Swiss Physical Society annual meeting, EPFL, February 2002. Presentation at III LHC Symposium, Chia, Sardinia, October 2001. Proceedings: published in Eur.Phys.J.direct C4S1:36,2002.